Do you understand what the doctors and nurses are saying as they plan your loved one's personal care program? Medical terms can be confusing and, therefore, anxiety-provoking. We all feel a certain comfort in knowing what to expect in the care of our loved ones. Patient and family education plays a vital part in helping relieve stress. Epecially We know at Spring Gate Rehabilitation and Healthcare Center that when we spell out medical jargon in layman's terms, we are removing a heavy load for everyone in the patient's life. Why is patient education is so important? When our residents first arrive, we assess their medical, mental, and emotional needs. We carefully examine everything in their medical file, from doctors' notes to scans. We then make our own notes as to specific therapies we feel will address any issues we find. Only then will our skilled staff walk through the proposed therapy plan with the patient and their family. We'll explain the way certain therapies will build core strength and how our programs will support better health results. Of course, any medications and side effects are also taken into account. The outcome is that patients and their families are able to clearly understand the expected benefits. Families naturally worry about their loved ones. Our knowledge-based service helps families deal with any physical and mental changes that a patient is showing. For example, reviewing the benefits of a respiratory care plan can quickly lessen anxiety. We will answer any questions and erase confusion about increased coughing after a particular treatment. Family education also helps everyone learn how they can be more involved in their loved one’s care. 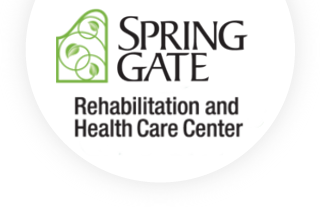 It is a major focus of the staff here at Spring Gate Rehabilitation and Healthcare Center to ensure that patients are aware of all aspects of their own care. There should never be questions over why certain treatments are being provided. Therefore, patient and family education plays a huge role in our center. You deserve to have all the medical terms explained simply and clearly. With our award-winning program, you can feel confident that your loved one is looked after with supportive quality care.